We talked to a local coffee house today to set up a series of singer/songwriter events for this coming spring and summer. We'll do one event a month and have our songwriter friends join us. Jasper is the county seat. Over the years, businesses in the downtown area fled to be closer to the highway...to the mall. But the downtown merchants who stayed have worked for years to revitalize the area. Those efforts were in vain...until a few years ago. The city put a lot of focus on main street and all of a sudden those efforts are paying off. Seventeen businesses opened downtown this past year. Microbreweries, restaurants, retail and a coffee house all opened for business. Now when you go downtown it's harder to find a parking place. You can sit in the courthouse square and hear music on Friday and Saturday evenings. You can hear the clatter of dishes and silverware and smell pizza and fresh seafood. It's an exciting time here. And believe me, we are way overdue. We'll start our events in April and they'll run through August. We are cranked. 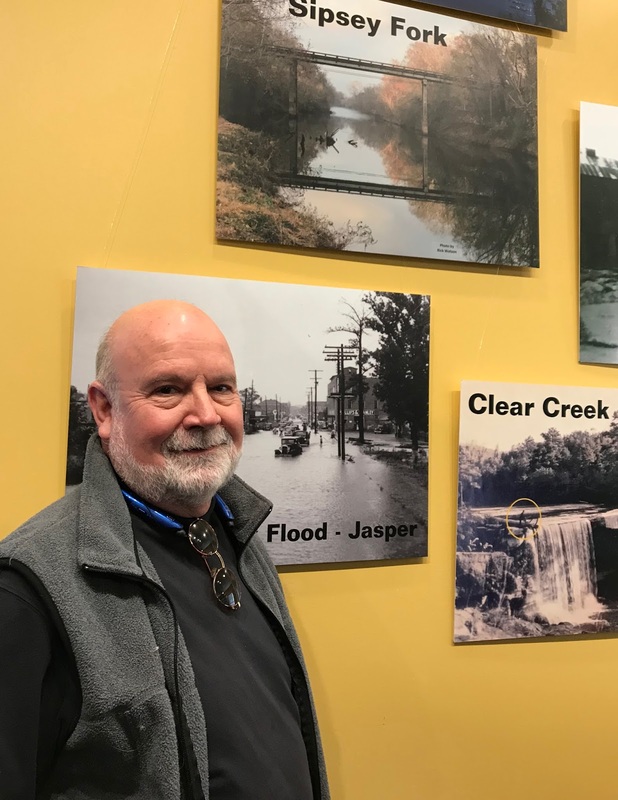 After we talked to the owner of the coffee house, we headed over to the Bankhead House for the opening reception for the Smithsonian Waterways exhibit. As I mentioned a few weeks ago, I had some pictures taken of the Sipsey Forks that they wanted to use in the displays. When we got there at 2 p.m. the place was packed. We'll have to go back at a later time to have a chance to look at all the interactive elements of the display. I was flattered they asked me to be a part of this event. Jilda snapped a picture of me by one of my photographs. I hope your Friday has been a good one. Sounds great. Our little town also 'reopened' but ours is mostly bars. We have become a bedroom for Charlotte. But it is still good to see cars parked so thick it is hard to find a parking place. Glad to hear you and Jilda will have another outlet to display your talents. It's taking some time for small towns to find their own niche after losing business to the big malls. Now the malls are in trouble with the on-line business, while small towns are coming back. What a heady feeling, seeing your photo on display! Jasper's revitalization sounds nice, indeed. I'm gonna have to put that courthouse square on my List. Congrats on your photos being used! You take great pics. Our downtown has been working hard to come back to life also. We have some new businesses and a restaurant/brewery just opened last month. Hopefully it will be a trend all over small town America!